Environmental degradation is the deterioration of the environment through depletion of resources such as air, water and soil; the destruction of ecosystems and the extinction of wildlife. It is defined as any change or disturbance to the environment perceived to be deleterious or undesirable. As indicated by the I=PAT equation, environmental impact (I) or degradation is caused by the combination of an already very large and increasing human population (P), continually increasing economic growth or per capita affluence (A), and the application of resource depleting and polluting technology (T). One major component of environmental degradation is the depletion of the resource of fresh water on Earth. Approximately only 2.5% of all of the water on Earth is fresh water, with the rest being salt water. 69% of the fresh water is frozen in ice caps located on Antarctica and Greenland, so only 30% of the 2.5% of fresh water is available for consumption. Fresh water is an exceptionally important resource, since life on Earth is ultimately dependent on it. Water transports nutrients and chemicals within the biosphere to all forms of life, sustains both plants and animals, and moulds the surface of the Earth with transportation and deposition of materials. The current top three uses of fresh water account for 95% of its consumption; approximately 85% is used for irrigation of farmland, golf courses, and parks, 6% is used for domestic purposes such as indoor bathing uses and outdoor garden and lawn use, and 4% is used for industrial purposes such as processing, washing, and cooling in manufacturing centers. It is estimated that one in three people over the entire globe are already facing water shortages, almost one-fifth of the world's population live in areas of physical water scarcity, and almost one quarter of the world's population live in a developing country that lacks the necessary infrastructure to use water from available rivers and aquifers. Water scarcity is an increasing problem due to many foreseen issues in the future, including population growth, increased urbanization, higher standards of living, and climate change. Climate change affects the Earth's water supply in a large number of ways. 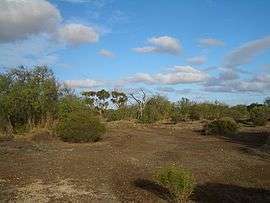 It is predicted that the mean global temperature will rise in the coming years due to a number of forces affecting the climate, the amount of atmospheric CO2 will rise, and both of these will influence water resources; evaporation depends strongly on temperature and moisture availability, which can ultimately affect the amount of water available to replenish groundwater supplies. Transpiration from plants can be affected by a rise in atmospheric CO2, which can decrease their use of water, but can also raise their use of water from possible increases of leaf area. Temperature increase can decrease the length of the snow season in the winter and increase the intensity of snowmelt in warmer seasons, leading to peak runoff of snowmelt earlier in the season, affecting soil moisture, flood and drought risks, and storage capacities depending on the area. 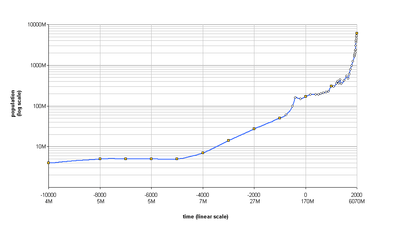 World population growth in a lin-log scale. 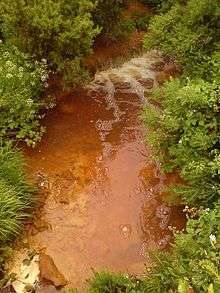 A stream in the town of Amlwch, Anglesey which is contaminated by acid mine drainage from the former copper mine at nearby Parys Mountain.